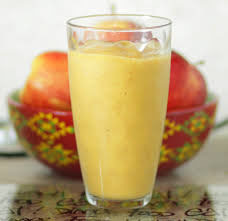 An apple a day - Ambrosia apple recipies for nutrition before noon. We all know the old adage about ‘an apple a day’ but if you’re finding it difficult to remember to eat your apple each day it might be best to do it first thing in the morning. Here are 5 creative ways to add Ambrosia apples to your breakfast routine. Slice off the top of your Ambrosia. Scoop out the middle, leaving at least a 1/4 inch wall (and bottom). Discard the seeds and core. Chop the remaining apple flesh and mix it with your favourite nuts, spices, dried fruit and oats. Spoon the mixture into the apple and pop the top back on. Bake it in a 350 degree oven for about 30 minutes. Hot, morning comfort in a bowl you can eat. If you’re prone to skipping breakfast because you’re always on the go, this blended recipe is for you. It’s simple, just drop a cored and sliced Ambrosia into the blender with a banana, a tablespoon of peanut butter and almond or soy milk. Blend until smooth and top with a dash of cinnamon. Pour it in a to-go cup and you’ll be powered up to start your day. If you love this simple recipe, experiment with more Ambrosia blended drinks like this super green option. If you love grilled cheese sandwiches, you’ll die for this breakfast idea. Toast up some healthy, whole-grain bread. Layer sliced Ambrosia apples under sharp cheddar cheese slices. Slip your toast under the broiler for a few minutes. Keep a close eye on it and once the cheese starts to bubble or brown, pull it out. The cheese will be gooey but the Ambrosia will still be crisp and the toast crunchy. If you want something a little sweeter, slather your toast with cinnamon honey first. We bet you’ve never thought to put Ambrosia apples in your quiche. It tastes great and adds an extra punch of health to any quiche recipe. Try it with bacon and cheddar or with brie and spring onions. If you prefer your quiche crust-less, Ambrosia apple slices at the bottom of your pie plate or tray help to give the quiche some shape – just like a frittata.